Parvovirus (PV) B19 is a recognized cause of red cell aplasia in a transplant patient. It is a known cause of erythema infectiosum, polyarthropathy syndromes, erythroid hypoplasia, and aplastic anemia in healthy individuals. In renal transplant recipients, PV B19 infection may enter the body through the respiratory tree or transplanted organ or may be reactivated from a latent infection. PVB19 infection is defined as the detection of PVB19 in clinical samples or as a positive PVB19 IgM serological test result. PVB19 disease is also defined as PVB19 infection in the presenceof anaemia, with clinical symptoms or bone marrow biopsy findings consistent with the diagnosis. There are no established guidelines forscreening for B19 infection in organ transplant recipients. Although there is insufficient evidence for universal screening of all donors and recipients, there is evidence to support screening in patients who have moderate to severe anaemia and for whom other causes of anaemia have been excluded. A 60-year-old male, who underwent renal transplantation on September 5, 2013, for immunoglobulin (IgA) nephropathy, presented with generalized weakness and malena for 10 days. He was on triple immunosuppressant, namely, prednisolone 10 mg OD, mycophenolate mofetil 750 mg in the morning, and 500 mg in the night and tacrolimus 2 mg BD. On admission, the patient was severely anemic, but with no systemic abnormality. He had a similar history 3 months ago. On esophageal tissue biopsy, he was then diagnosed to have cytomegalovirus (CMV), and polymerase chain reaction (PCR) test identified PV B19. He was given intravenous (IV) ganciclovir 500 mg daily for 14 days followed by valganciclovir 900 mg once daily for 14 days. He had also received IV IgG 20 g in 100 ml normal saline OD for 5 days. He was discharged in satisfactory condition. At present, he was admitted with recurrence of symptoms and investigations revealed hemoglobin of 6% g, TLC 3100/cumm, platelets 1.2 lacs, urea 40 mg/dl, and serum creatinine was 1.4 mg/dl. The electrolyte levels and liver function studies were normal. 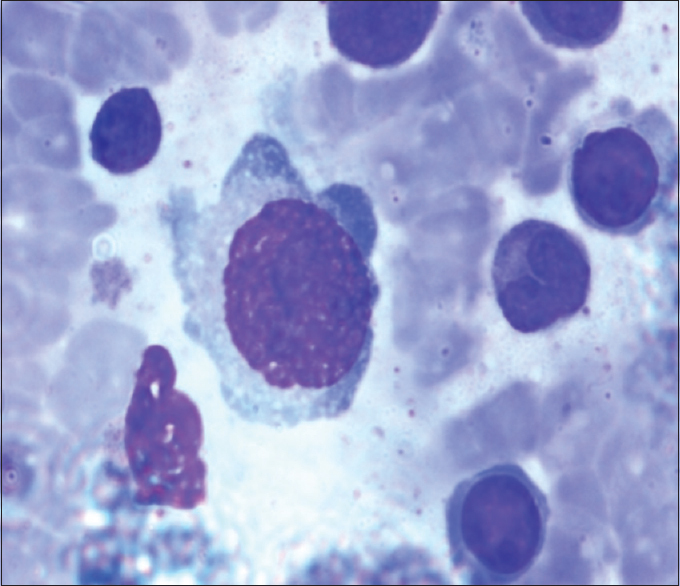 Peripheral smear examination showed mild anisopoikilocytosis with occasional elliptical cells. CMV DNA was found to be negative. 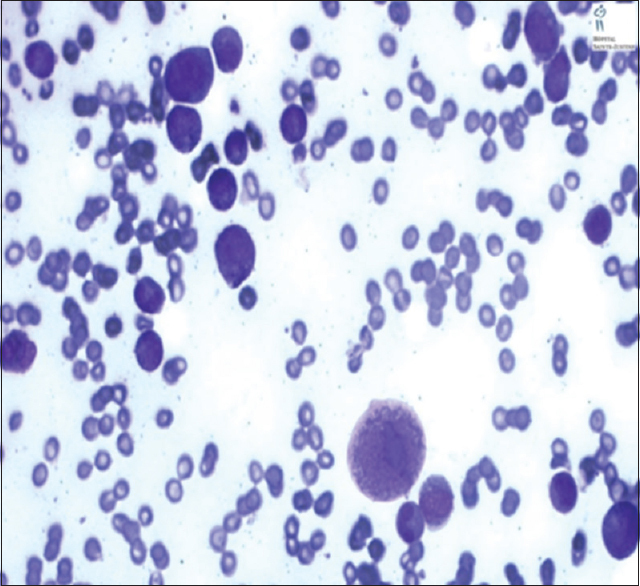 The patient underwent bone marrow biopsy [Figure 1] which showed erythroid hypoplasia with few giant erythroblasts showing intracellular inclusions strongly consistent with recurrent parvovirus (PV) infection [Figure 2]. To confirm these findings PCR test for PV B19 was performed which came out to be positive. On quantification study, it was 4 × 104 copies/ml. The patient was started on IV IgG therapy in dose of 5 g in 100 ml NS for 5 days. At present, he is on low dose IgG prophylaxis with 400 mg/month. His blood parameters improved after treatment. On discharge, his blood investigations were Hb 10.2% g, TLC 6500/cumm, platelets 1.6 lacs along with normal renal parameters. PVB19 infection is defined as the detection of PVB19 in clinical samples or as a positive PVB19 IgM serological test result. PVB19 disease is also defined as PVB19 infection in the presence of anemia, with clinical symptoms or bone marrow biopsy findings consistent with the diagnosis. There are no established guidelines for screening for B19 infection in organ transplant recipients. Although there is insufficient evidence for universal screening of all donors and recipients, there is evidence to support screening in patients who have moderate-to-severe anemia and for whom other causes of anemia have been excluded from the study. For most immunocompetent individuals, serologic testing for B19 virus-specific antibodies is most practical and is measured using enzyme immunoassays, which usually use recombinant capsid proteins. Furthermore, in organ transplant recipients, diagnosis by serology can be confounded by administration of blood products or Ig after transplantation, because these therapies may produce false-positive IgG antibody tests. Thus, identification of the viral DNA by PCR is preferred for diagnosis in these patients. The approach to therapy of infection depends on host factors such as immune status, underlying conditions, and manifestations of infection. Commercial Ig (IVIG), a significant source of anti-B19 antibodies, has proved to be efficacious, although no controlled studies have been carried out. Various regimens have been reported with favorable outcomes, but on the basis of the pooled data, 400 mg/kg per d for 5–10 consecutive days seems to be clinically useful in most cases. Although the mode of transmission of B19 infection in the normal host is mostly through the respiratory tract, it is less well defined in the transplant setting. Certainly, the short-time lapse between transplantation and onset of illness that has been reported in some has the characteristic of donor-transmitted disease, but this is often difficult to prove. The postrenal transplant state on immunosuppression therapy is now recognized as one of the settings for CMV and PV B19 induced red cell aplasia. Tacrolimus and mycophenolate therapy has been associated with these infections. It is important to diagnose these infections in postsolid organ transplant patients not only because they are treatable but also to prevent nosocomial infections to other patients. The bone marrow biopsy showed characteristic cytomorphologic features of PV B19 infection. There was an excellent response to IgGs. Diagnosis of such infection requires high amount of suspicion, mainly in posttransplant cases with anemia that is unresponsive to vitamin supplementation and erythropoietin. Recurrent PV B19 infection in postrenal transplant patients under immunosuppressant therapy presents as anemia unresponsive to vitamin supplementation and erythropoietin. Early and prompt diagnosis and treatment with IgGs can give excellent results. Shan YS, Lee PC, Wang JR, Tsai HP, Sung CM, Jin YT, et al. Fibrosing cholestatic hepatitis possibly related to persistent parvovirus B19 infection in a renal transplant recipient. Nephrol Dial Transplant 2001;16:2420-2. Eid AJ, Brown RA, Patel R, Razonable RR. Parvovirus B19 infection after transplantation: A review of 98 cases. Clin Infect Dis 2006;43:40-8. Waldman M, Kopp JB. Parvovirus B19 and the kidney. Clin J Am Soc Nephrol 2007;2 Suppl 1:S47-56. Anderson LJ, Tsou C, Parker RA, Chorba TL, Wulff H, Tattersall P, et al. Detection of antibodies and antigens of human parvovirus B19 by enzyme-linked immunosorbent assay. J Clin Microbiol 1986;24:522-6. Peterlana D, Puccetti A, Corrocher R, Lunardi C. Serologic and molecular detection of human parvovirus B19 infection. Clin Chim Acta 2006;372:14-23. Murer L, Zacchello G, Bianchi D, Dall'Amico R, Montini G, Andreetta B, et al. Thrombotic microangiopathyassociated with parvovirus B 19 infection after renal transplantation. J Am Soc Nephrol 2000;11:1132-7. Pamidi S, Friedman K, Kampalath B, Eshoa C, Hariharan S. Human parvovirus B19 infection presenting as persistent anemia in renal transplant recipients. Transplantation 2000;69:2666-9. Shimmura H, Tanabe K, Ishikawa N, Tokumoto T, Toda F, Toma H, et al. Discontinuation of immunosuppressive antimetabolite for parvovirus B19-associated anemia in kidney transplant patients. Transplant Proc 2000;32:1967-70. Liefeldt L, Buhl M, Schweickert B, Engelmann E, Sezer O, Laschinski P, et al. Eradication of parvovirus B19 infection after renal transplantation requires reduction of immunosuppression and high-dose immunoglobulin therapy. Nephrol Dial Transplant 2002;17:1840-2.